We've had little glimpses of Fall here in Utah, but they have been brief. I've been able to bust out scarves, sweaters, & boots on a few occasions, but...this week we're back in the 90s. That is just far too hot for September; I'm hoping it doesn't last. When it gets too hot in the valley, Liam & I always head straight for the mountains! We meet with a play group (forest school actually - more on this at another time) twice a week up in Park City, where we get in a little escape. And it is full blown Fall up there! The leaves have been turning into beautiful oranges, yellows, & reds for a couple of weeks now! 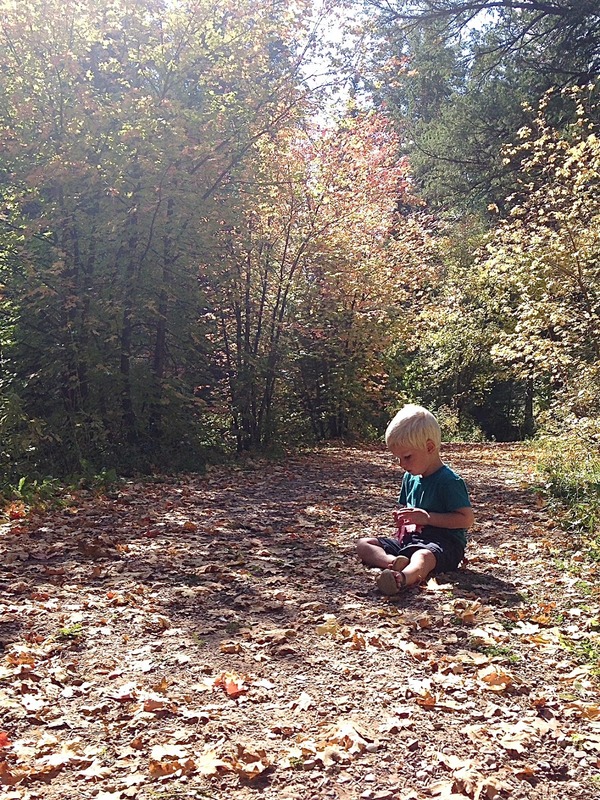 Liam is all about the crunchy leaves that litter the trails. I can barely get him to keep hiking when there are leaves to be thrown, crushed, & jumped in everywhere we walk. On Monday, we checked out a new trail where the colors were particularly vibrant. Liam has been much more independent lately, so it is fun to just sit back and watch him explore. He seemed just as in awe of everything as I was. I could have taken picture after picture, but instead I tried to capture a few moments and put my camera away. While Fall is Utah is beautiful (and everyone here will tell you so), I still think it doesn't quite rival Fall on the East Coast. I am always nostalgic for Delaware around this time of year! Anywhoo, Fall is here so bring on pumpkin everything! sigh. So beautiful! How nice you can get away and visit the fall when it hasn't made it's way to you yet! I miss the changing of the leaves. The only fall I know is a CO fall. It was pretty spectacular. Good job snapping a few pics and then just living in the moment! I just realized how I'm able to do that more now with a better camera, and I've had it for a while but I'd forgotten how many pics I had to snap with my terrible one to get a half way okay one. That alone is worth investing in a better camera! You can capture some and then live it! Thank you! I sure do think so too! Fall on the east coast is beautiful. I remember how pretty the university of Delaware campus was in the fall. I am taking Chris and Noah down to the campus in a few weeks. So far though the leaves haven't changed color... I hope they do in time for our visit! I bet fall on the east coast is to die for! Never been around that time of year, definitely something I'd like to see! Gorgeous photos! Love these! He is so stinking cute! Oh my I love his name! LIam is one of my favorite boy names, and it looks so nice in the mountains! Thanks! It has become a little trendy lately (we were unaware of this when we named him), but since it fits so well with our Irish last name, I am okay with it! Insanely jealous of that fall weather and those gorgeous photos in those beautiful leaves! It's been in the 90s and 100s here the past week and this week it was actually cool (read : in the 80s LOL). CANNOT wait for fall to actually come! Bring on the boots, scarves and sweaters! Utah has a surprisingly long Fall which I love! We will be enjoying it for at least a couple months! Fall! Yeah! I love these pictures. 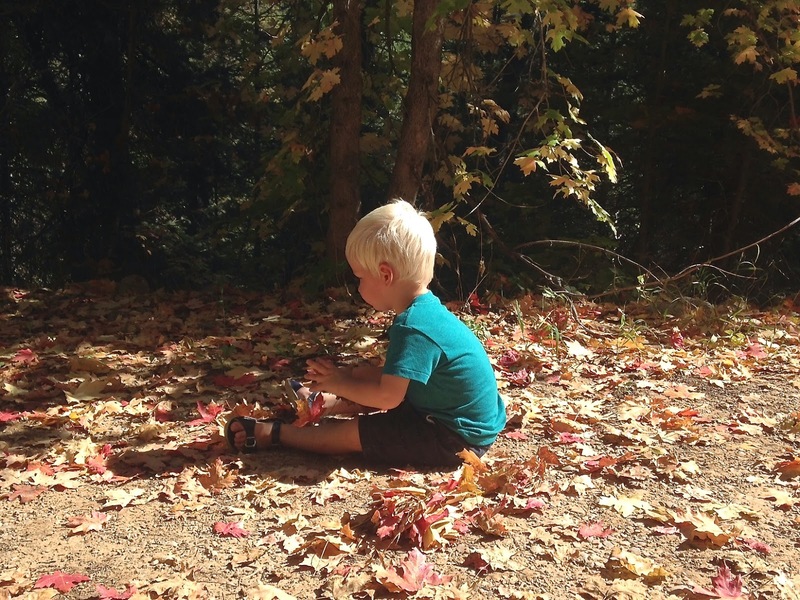 I think kids love the sound of the CRUNCH under their feet. 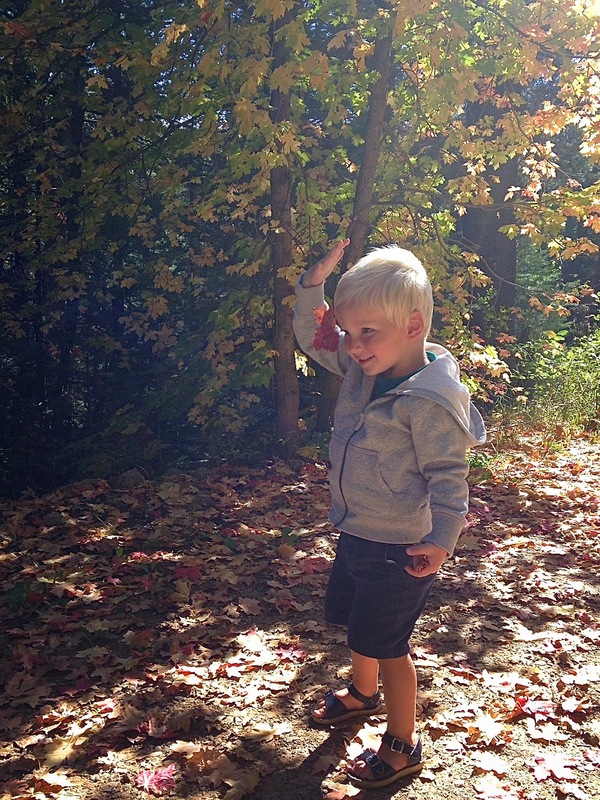 I remember stepping on leaves when I was a kid just hear the sounds they make. I still do that now, like go out of my way to step on one. Haha. Young hearts forever!